• Amundsen, Darrel. (1996). Medicine, Society, and Faith in the Ancient and Medieval Worlds. Baltimore: Johns Hopkins University Press. Amundsen’s exploration of early Christian attitudes toward medicine and physicians includes a discussion of the spiritual usefulness of suffering and illness—and how this made Christian views significantly different from those of the pagans. • Crislip, Andrew T. (2005). From Monastery to Hospital: Christian Monasticism and the Transformation of Health Care in Late Antiquity. Ann Arbor: University of Michigan Press. Crislip argues that the origin of the first hospitals can be traced to monastic infirmaries. • Ferngren, Gary B. (2009). Medicine and Health Care in Early Christianity. Baltimore: Johns Hopkins University Press. Ferngren argues that early Christians employed treatment by physicians and that their greatest contribution to medicine was compassionate medical care and philanthropy. • Hands, A. R. (1968). Charities and Social Aid in Greece and Rome. Ithaca, NY: Cornell University Press. An important study of charity and philanthropy in the classical world, where assumptions led to a very different approach than one finds in early Christianity. • Holman, Susan R. (2001). The Hungry are Dying: Beggars and Bishops in Roman Cappadocia. Oxford, New York: Oxford University Press. An important study that describes the charitable ministry to the poor, especially lepers, by the Cappadocian fathers of the third and fourth centuries A.D.
• Horden, Peregrine. (2008). Hospitals and Healing from Antiquity to the Later Middle Ages. Aldershot: Ashgate. A collection of papers on the earliest hospitals of the early Christian and medieval periods. • Majno, Guido. (1991). The Healing Hand: Man and Wound in the Ancient World. Cambridge: Harvard University Press. An extensively illustrated description of medicine in the ancient world. • Miller, Timothy S. (1997). The Birth of the Hospital in the Byzantine Empire. Baltimore: Johns Hopkins University Press (paperback edition with new introduction). Miller argues that the ancestry of modern Western hospitals can be found in Christian charitable institutions of the fourth-century Byzantine empire. • Mitchell, Piers D. (2004). Medicine in the Crusades: Warfare, Wounds and the Medieval Surgeon. New York: Cambridge University Press. Mitchell is both a practicing medical doctor and an active medieval historian. While one section of the book is devoted to his particular interest, osteoarcheology (the evidence ancient bones provide about wounds and illness), this book also contains a substantial discussion of the Hospital of the Order of St. John in Jerusalem. • Orme, Nicholas and Margaret Webster. (1995). The English Hospital, 1050-1570. New Haven: Yale University Press. 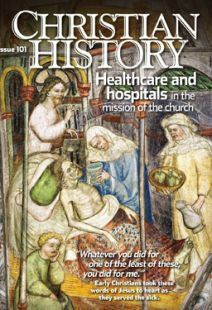 An excellent summary of how medieval hospitals were funded and built, how they worshipped, what treatments they used, and what kinds of people they served. • Rawcliffe, Carole. (2006). Leprosy in Medieval England. Woodbridge: Boydell Press. Rawcliffe challenges the idea that medieval lepers were cut off from the community. She emphasizes the role lepers played in the salvation of the healthy and the idea that Christ himself was quasi leprous (like a leper) in his crucified humanity. • Risse, Guenter B. (1999). Mending Bodies, Saving Souls: A History of Hospitals. New York: Oxford University Press. The standard history of hospitals from their origin to the present by a leading medical historian who emphasizes their religious character. • Stark, Rodney. (1996). The Rise of Christianity: A Sociologist Reconsiders History. Princeton: Princeton University Press. An original study of early Christianity by a sociologist of religion who argues that Christians’ philanthropic activities aided the rapid spread of Christianity through the Roman empire.